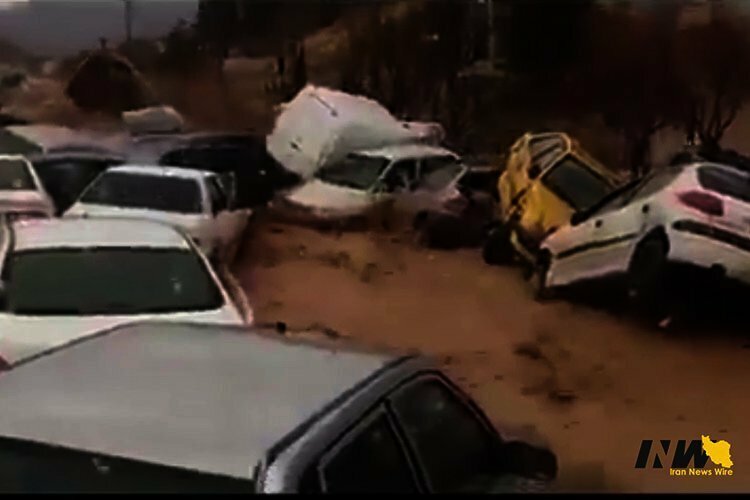 Rain quickly leads to ravaging floods in northern Iran. Villages are destroyed and thousands are left homeless. The rain and floods quickly overtake almost the whole country. State-run tv: 36% of the country’s road networks have been damaged. The floods wash away whole neighborhoods in some areas in the western province of Lorestan. Iran announces that around 70 people lost their lives during the more than two weeks of flooding. And recent floods that ravaged Poldokhtar in Lorestan province. Anger and frustration quickly mounts among locals who lost everything to the floods. They blame the regime for destroying the environment and the Islamic revolutionary guards corps for the excessive building of dams and other barriers that block natural water routes, directing floodwater towards cities and villages. The regime dispatches police and IRGC forces to flood-hit areas to crack down on unrest. A man identified as Aboud Jalizi dies after IRGC forces open fire on angry villagers in the southwestern province of Khuzestan. The father of seven was protesting the IRGC breaking the villagers’ flood barriers directing water into their village and farmlands. In what seems like an empty promise, the regime said it would pay off all the damages caused by the floods. More than a year after the Kermanshah earthquake in western Iran, locals still live in tents. 16 years after the 6.6 bam earthquake in southeastern Iran, some families still live in trailers. Flood stricken Iranians are distraught and furious and say that the regime is not providing adequate flood relief. The handling of the floods is just one of the many failures of the Iranian regime in the past 40 years.